Whisky labels that are less real than the pixels they are made of. Not every whisky you see is real. I coined the term 'phantom whisky' to draw attention to the phenomena of distilleries promoting photoshopped images of non-existent whiskies. We choose whisky, partially, by sight— by its colour—and if a whisky hasn't been made, to show it bottled is surely misleading. My “phantom” characterisation incensed the distilleries that had published such images and they argued that the images were merely indicative and no deception was intended. I was required to take a much lighter tack, and not permitted to name names. Here are the names. Peppery, Peaty, Oaky. A fully adult whisky. Great focus on flavorful highlights across the palate and an unmistakable peaty influence. Deeper down, the many facets marry into a unified core beneath the glinting, dynamic surface. Brisk and bracing, crests of smoke inhabit each successive wave of honey and vanilla. Fresh Cradle Mountain water spreads out the sweets into creamy custard, while intensifying the pepper and giving rise to wisps of woody smoke. This whisky was not even distilled when the note was composed and it will not be available until 2019, the Cradle Mountain Whisky site itself stated in 2016. Phantom whiskies suggest that the distillery has produced more than it has, is more advanced than it is, and is more capable than it might be. 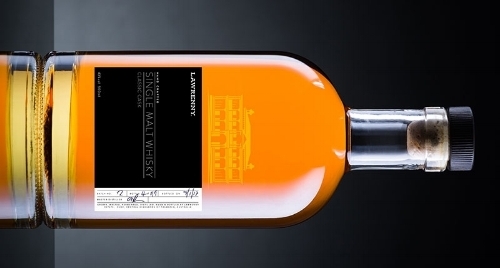 The most audacious phantom for me is the peach-coloured Lawrenny Single Malt. Its label stated its ABV and a hand-written, signed, batch-statement shows the cask number and disgorging date. All presciently understood because, at the time, Lawrenny had no whisky, no barrels of spirit in bond, no stills, no brew—naught but a shed, a field of barley and a 700ml bottle of peach-coloured something. Spooky!